The launch of the AS5172A/B magnetic position sensors has been announced by worldwide supplier of high performance sensor solutions, ams. The sensors feature a two-wire PSI5 interface for fast and secure transmission of their precise rotary position measurements. The AS5172A and AS5172B System-on-Chip (SoC) devices are 0 to 360° contactless rotary magnetic position sensors which provide absolute angle measurements in high 14-bit resolution. The sensors have been developed as SEooC devices according to the automotive safety standard ISO26262, and feature extensive on-chip self-diagnostic systems. This makes the AS5172A/B suitable for safety-critical automotive applications, enabling a vehicle system to meet the highest ASIL safety level requirements. In addition, the PSI5 interface in the AS5172A/B parts conforms to the latest standards, as set by the PSI5 specification versions 1.3 and 2.1. AEC-Q100 qualified, the AS5172A/B devices support many automotive remote position sensing applications including brake and gas pedal position sensing, throttle valve and tumble flaps, steering angle sensors, chassis ride height sensors, Exhaust Gas Recirculation (EGR) valves, and fuel-level measurement systems. Based on Hall sensor technology, the AS5172A/B devices measure the orthogonal component of the flux density over a full-turn rotation and compensate for external stray magnetic fields with a robust architecture centered around a 14-bit (0.022° resolution) sensor array and analogue front end. The AS5172A/B can also be programmed to support a sub full-turn angular range of motion as small as 0 to 10°, to achieve the best resolution for the application. The high sensitivity Hall sensor front ends also enable the devices to work with small, low cost target magnets and support a wide magnetic field input range of 10-90mT. Only a simple two-pole magnet rotating over the center of the package is required to provide a nearly instant indication of the magnet’s absolute angular position. The magnet may be placed above or below the device. The AS5172A/B operate over a wide supply voltage range of 4 to 16.5V, and support up to +20V of overvoltage protection. In addition, the supply pins are protected against reverse polarity up to -18V. 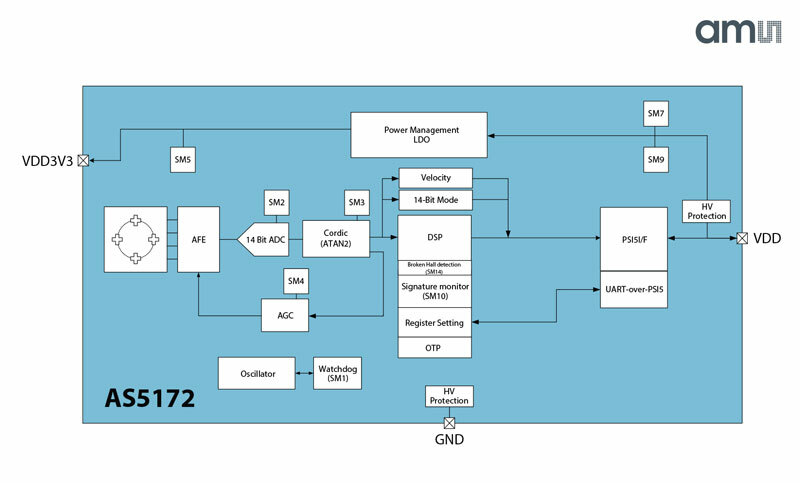 The AS5172A/B is also easily programmed over the device’s VDD pin via a single-wire UART-over-PSI5 interface, minimising the number of pins on the application programming connector. The AS5172 is available in a TSSOP14 package (AS5172B) and in an SIP package (AS5172A). The SIP package (System in Package) integrates the AS5172 sensor die together with the decoupling capacitors to yield improved ESD and EMC performance, eliminating the need for a PCB, and reducing overall system sensor costs. The AS5172A and AS5172B operate over a -40 to 125°C and -40 to 150°C temperature range, respectively.